Knitting has resumed. The body is almost done, but *someone* hasn’t decided how to finish the bottom of the sweater. Ribbing? I was going to rib to match the neck, but I think I might want the neck more open, and while I’m ripping, I can redo it in another stitch. Hemmed? Garter? I do plan on doing the body and sleeve edgings in the body yarn with the very last, cast-off row in the acidy green. 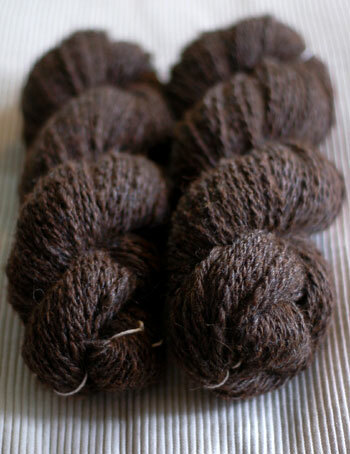 Handspun from Fantom Farm wool/alpaca mix roving. Spun from one of these. This is the second 8 oz. I’ve spun. I really think this might do me for the sweater. I got about 10 more yards out of this 8 oz. than the last. Not too shabby, and the yarn has the same wpi, so should knit up the same. There’s always that moment of fear when re-skeining handspun yarn for a large project when you were naughty and didn’t spin it all at once. You might notice, if you are reading this post on a news aggregator, that there is now a copyright notice at the end of each post. This is because I have yet again discovered someone re-blogging my entire blog on their site. I have a feed so that people may view my posts at their convenience on aggregators, not so people can profit, however that may be, from my work. It’s being discussed at length on Ravelry, if you’re there. The legality if re-blogging is a little murky, but I say stealing is stealing and want to be sure that people understand that if they’re not reading my content here or on, say, Bloglines, that it is being published against my wishes. Here’s the WP plugin I’ve used, if you’d like to add a copyright notice to your feed. Want to know if another site is publishing your content or just plain plagiarizing? Search Copyscape. There are a lot of unoriginal people out there! So as not to leave on a sour note, my knitting basket. I swear that size 3 Add isn’t in there. Yeah, I have a needle gnome too. They must like the 40inch ones. My size 5 is totally gone. I mean really, how could I loose something that long and pointy? i think it is tomten that took the needle. in scandinavian tradition this is things they like to do and we have a certain expression for it. drillenisser or teasing tomtens. and no matter how far away you move the tomten will move along. they are definitely not only sweet elfish little creatures. oh baby clothes bliss. i love it although i am not sure that i think they are finished as fast as every one likes to believe. Here’s something else happy. I received my yarn this week and everything is super lovely as always. Tundra is even more stunning in person. Thanks bunches! My needle gnomes are 2 and 4 year old boys who like sharp pointy things for sword fights, but I don’t think that’s your problem. I have another happy thing for you- I have 3 WCTP projects going. Both my sons asked for sweaters and my mom is gatting socks! have you checked under the sofa cushions? eh. you probably have. Those booties are too cute. 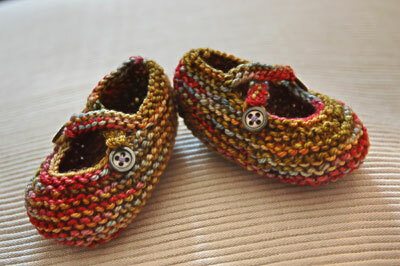 I might have to make a pair, and I don’t even know any babies! I love those little shoesies. Gonna have to make ’em for some future granddaughter. That alpaca is beautiful, the color is so rich. Wow I’ve never heard of anyone re-blogging. Sorry about that. I love the booties and have a pair on the needles myself. can’t wait to see yours. I’m with E to the M, I’ve never heard of re-blogging and find it mind boggling. I mean, what’s the point? Ugh. c’mon, point the finger, don’t be shy. Those booties are so cute! Love the color of the yarn. If your nuts like me and knit in bed all the time you might want to check your pillow cases. How needles end up there is beyond me but at least once a month I find some. And murky or not you are right stealing is stealing. If someone really wants to show people great things on the internet all they have to do is make a link- a la your sock gnomes link.